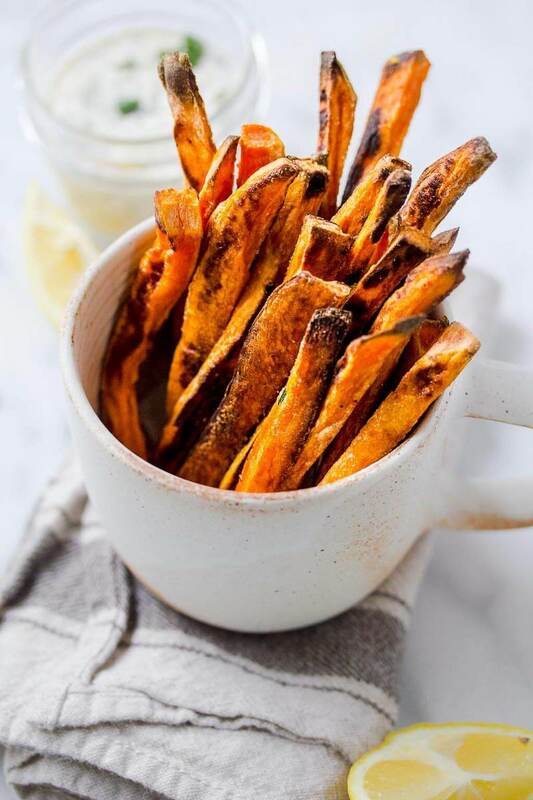 Sweet potato fries are such great snack or side, but if you are trying to eat healthier, try baking them instead. The tricky part is getting them crispy, as sweet potatoes are naturally softer than other types of potatoes, and take a few extra steps to get the result you’re looking for. Sweet potatoes might be one of the world’s healthiest foods! Full of vitamin A, beta carotene, potassium, magnesium, vitamin B6, and fiber, they may help protect eyesight, improve heart health and improve immunity. Cut your fries evenly and as close to 1/4” as possible. The more evenly your fries are cut the more consistent results you’ll get, and the thinner they are the crispier they will be. To make it super easy to cut nicely shaped fries, I like to take my peeled sweet potato and cut a slice off one of the sides, and then lay the potato cut side down on the cutting board. This will keep the potato from sliding around. Then cut 1/4” thick slabs of sweet potato which can easily be stacked to cut into strips. Season them with salt and pepper last. Add a little corn starch, potato starch or arrowroot powder before tossing them in oil. This helps them achieve a crisper texture! Use parchment paper to line your sheet pan if you you want less crispy edges and for them to be less blackened. I personally love a little charred edge on my fries, so I like to cook them directly on the pan. Try these with a great veggie burger for a perfect meal. 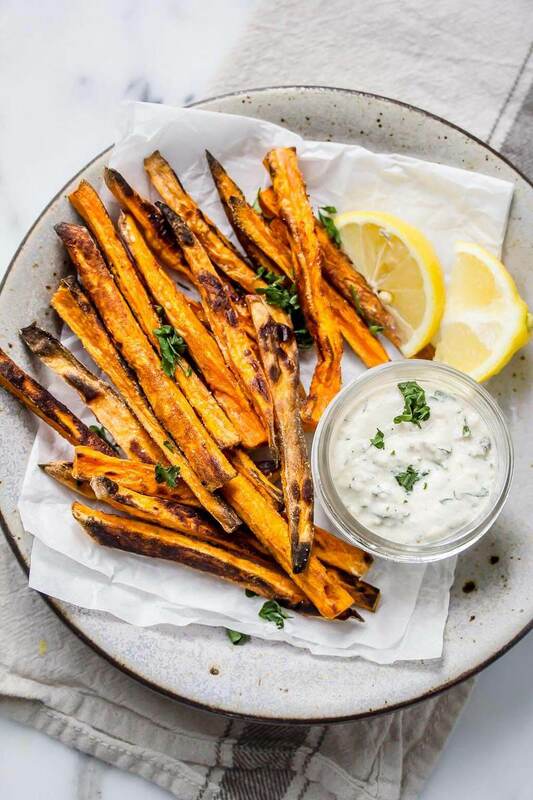 Healthy baked sweet potato fries with vegan lemon caper aioli makes a delicious and addictive treat! To make the Lemon Caper Aioli, place the cashews, water, lemon juice, sea salt and black pepper in a blender. Puree until smooth and then transfer to a small bowl. Mix in the chopped capers by hand and stir well. Set aside until ready to use. Peel and cut the sweet potato into the 3 inch long strips between ¼” and ½” wide. Transfer the sweet potato fries to a mixing bowl and toss in the arrowroot powder until well coated. Add the olive oil and toss again. Do not add the salt until the end. 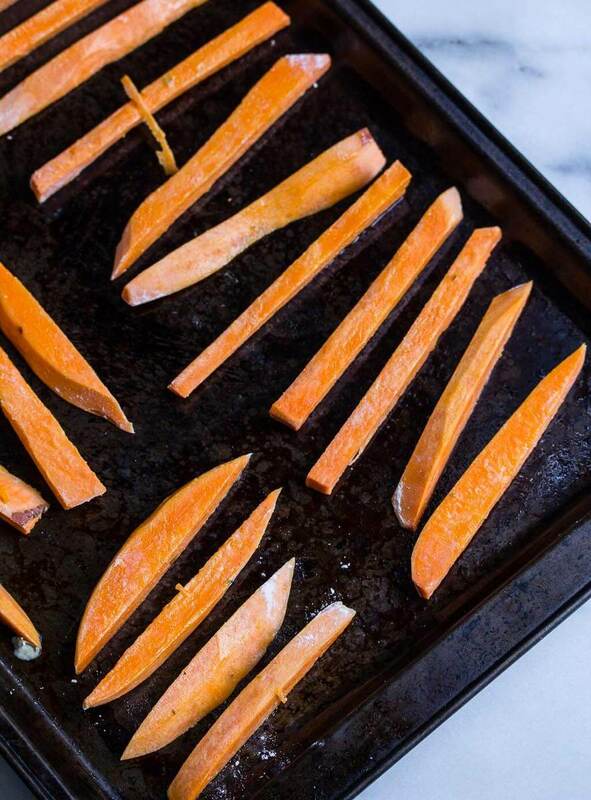 Spread the sweet potato fries onto an oiled sheet pan with about ½” between the fries. Don’t crowd them or they will steam each other and come out too soft. Place the sheet pan in the oven and roast for 15 minutes. Remove from the oven and flip the fries and place back in the oven for another 15 minutes. After the cooking time is complete, turn off the oven and open the oven door. Allow the fries to stay in the open oven for 10 minutes to help them get crispy.